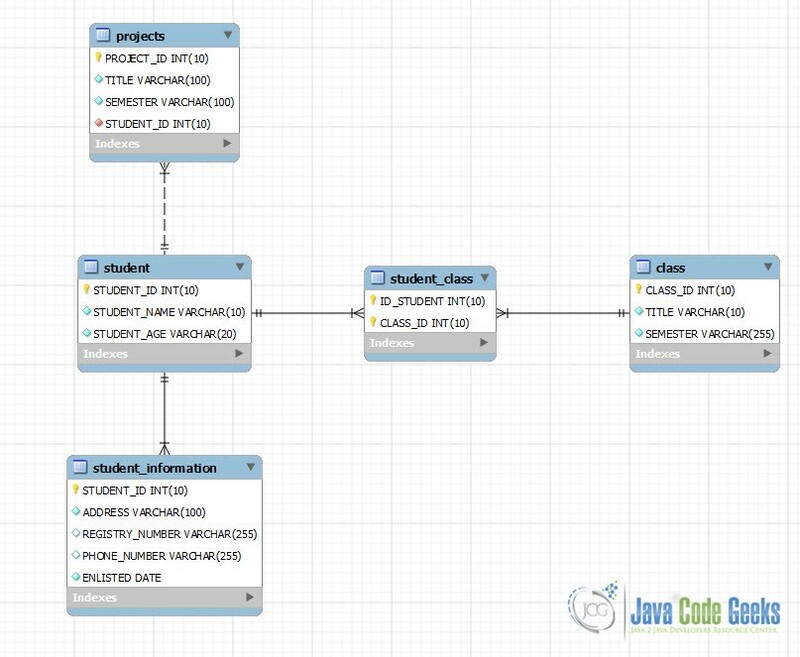 In this example we are going to see how to map classes to databases tables which have Many-to-Many relationships. We are going to see the mapping both with XML Mapping and with Annotations. Imagine that you have tables student and class in a database. You want every student to be able to work on multiple class, and each class can be followed by many students. So, student has many-to-many relationship with class. In relational databases the above relationship is imlemented using a third table that somehow connects the aforementioned two tables that participate in the ralationship. Let’s see the MySQL scripts that creates these tables. The above class will be mapped, of course to “student” table. Note that Student class holds a HashSet of Class instances. This means that one student can work on many classes. The above class will be mapped, of course to “class” table. Note that Class class holds a HashSet of Student instances. This means that many student can work on one classe. All in all, the above classes state that many students can work on many classes. Here we describe that the Student class has a many-to-many relationship with Class. We also use inverse = false attribute . inverse attribute is always present in one-to-many and many-to-many relationship and it denotes which side is responsible for the relationship. It’s default value is false. In our case Student class is the relationship owner. That means that the Student class is responsible to handle the “connection” between these two classes (Student and Class). Thus, if you want to add a new “couple” to the relationship, you have to add a Student instance to the Classe‘s assignedStudents set. And again, if you want to delete a ”couple” of the relationship you have to null (or simply remove) the student isntance from the assignedStudents set. lazy = true attribute, is a hint to the persistence provider runtime that data should be fetched when it is first accessed. If no fetch strategy is declared, then lazy is used by default. On the other hand, EAGER strategy is a requirement on the persistence provider runtime that data must be fecthed when asked and not only when accessed. The above code has some notable parts. First of all we obtain a Session from the SessionFactory instance of our HibernateUtils class. Then we start a transaction with the database. We create some Student and Class instances. We add to set of the Class instance, the students that follow that class, and at each student we add the classes that he follows. Then we simply have save the student isntances to the Hibernate Session and commit. 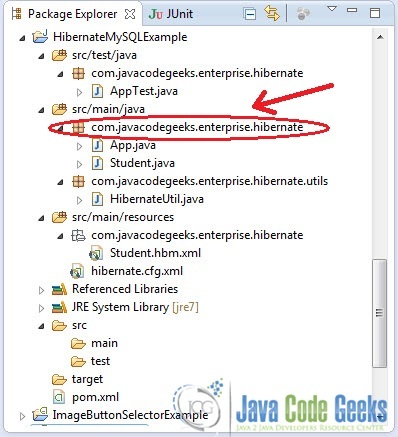 Upon transaction commit the Hibernate session is flushed/synchronized with the database. So the newly created Student intance residing in the Session is persisted to the database. For this part we just have to do some updates to the previous project. The main difference is that we are not going to use Student.hbm.xml and Class.hbm.xml to map the classes to the corresponding tables in the database. We will use special annotations in the java classes that will dictate the mapping. @ManyToMany : used to define a many-to-many relationship with the Class and Studen classes. The fetch = FetchType.LAZY attribute is a hint to the persistence provider runtime that data should be fetched when it is first accessed. If no fetch strategy is declared, then lazy is used by default. On the other hand, EAGER strategy is a requirement on the persistence provider runtime that data must be fecthed when asked and not only when accessed. When we have 2 associated classes, one of them has to be the relationship owner. The mappedBy = "studentClasses" attribute denotes that the Student class is responsible to handle the “connection” between these two classes (Student and Class) and is the owner of the relationship (as we described before). @JoinColumn : declarers the join column. The name parameter declares the column in the targeted entity that will be used to the join. @JoinTable : in many-to-many relationships it declares the join table, that holds the many-to-many relationship associations. This table holds the foreign keys to the associated tables. 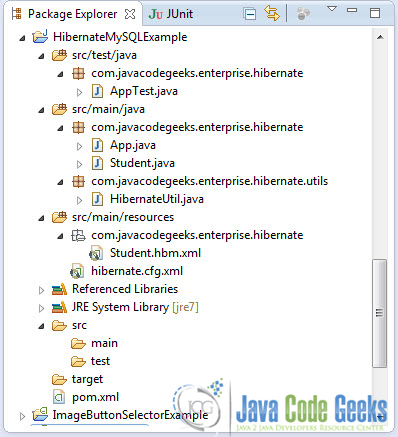 The joinColumns attribute is used to desrcibe the join columns of the owener of the relationship (Student). 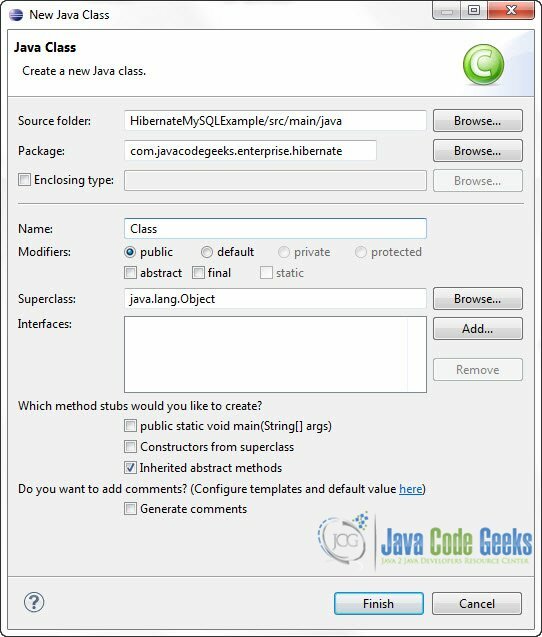 The inverseJoinColumns attribute is used to describe the join columns of the target entity (Class).